Looking to Build a Deck over a Concrete Patio? Read This First! Our Ipe, Cumaru, and Tigerwood decking are among the most sought after materials to use in a variety of outdoor applications. One specific application that’s asked about often are installations over concrete pads. This situation is common in many pool, patio and porch designs. The concrete gets cracked, stained and pitted and the owners want to cover it with something nice without busting up all the old concrete. Unfortunately, traditional long-length decking boards don’t perform very well over concrete. Wood is a material that breathes; it absorbs and releases moisture, adjusting itself to the humidity of its environment. To do this, all four sides of the board must receive sufficient air flow, achieved by proper gap spacing and adequate ground clearance. We recommend 18” of ground clearance. Installing decking boards on top of concrete prevents air from circulating evenly across all four sides of the wood, leading to rapid changes in only one side of the board. This uneven release of moisture causes cupping, warping, and twisting. Concrete tends to retain moisture and heat much longer than other materials. If the concrete becomes very hot in high humidity, it will release enormous amounts of warm, wet air directly into the face of the decking on top of it. As the wood absorbs this excess heat and humidity, it will twist, warp, and cup. Fortunately, there’s a great alternative to removing the concrete pad and building a deck with joists and posts: Advantage Deck Tiles™. These tiles are made specifically for installations directly over a flat surface such as concretes pads or balconies. With Advantage Deck Tiles™ you can give your outdoor living space a new look in just under a day at a fraction of the cost of building a new deck. This entry was posted in Decking Tiles, Do-It-Yourself, How-to Build and tagged concrete and decking, decking on concrete, decking over concrete patio, how to build deck over concrete on July 21, 2015 by Mr. Ipe Hardwood. Laying ipe over concrete looked great. Now is there a good reason this technique can’t , or shouldn’t be done over crushed stone or sand? Thank you for taking the time to write to us and we are glad that you found the video entertaining. The reason why Deck Tiles aren’t recommended to be used directly over crushed stone or sand is because it’s an unstable surface. Using an unstable surface can cause the deck tiles to be laid unevenly which can lead to tripping hazards. Unfortunately we do not have product testing on the tiles for commercial use in this type of application. We highly encourage you to consult a licensed professional like a structural engineer for such a system to ensure you reach your desired performance expectations in this custom application. 2 Should i go only for the decking tiles? Has this ever been used around a pool on an old cracked deck? Our system has been used in both situations. It’s a very popular way to give pools a unique look without compromising slip resistance. We don’t recall anyone using it right on top of an old cracked deck. Normally this is because a cracked deck would serve as a support and if the deck hasn’t gotten proper maintenance, it may have some structural issues that need to be addressed. I plan on using deck tiles on my concrete patio, but I have three steps down from my house. What do you recommend I cover the steps with? With some help from a skilled installer, you can take the 1×4 or 21×4 product and cut to both brace and face/skin your concrete steps down to the patio. It would help to maintain continuity of the smaller slats of the tiles and your best bet to maintain dimensional stability of those boards. Brace pieces will still need something to stand off the concrete the same way deck tile connectors keep the tiles off the concrete 3/16”. ** Please note ** This is not a recommended installation method of which we can predict with any certainty the proper performance of individual deck boards. Hi, if DYI decking tiles, how can I install the 20×20 tiles around the pool all the way to the back wall if the wall is not completely parallel to the pool and I have to cut the tiles in an angle, is that possible? Hope I was clear on my explanation. My 18×24 concrete deck is badly cracked, but not yet uneven. What is the chance that the cracks could “creep” into the underside of the decking, and create even more problems? Is this a raised concrete deck? I have several questions: 1. 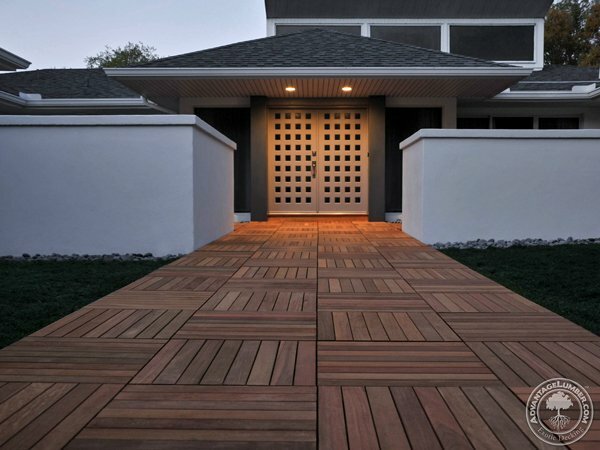 Can IPE linear decking boards (4″ or 6″ widths) be used in a combined deck tile design? 2. How are these linear boards attached and connected to the concrete/deck tiles? 3. My concrete patio is covered and not exposed to sunlight. I plan to extend the concrete into a sun lite area and cover the new concrete with decking tiles. Will ALL the IPE board surfaces turn the same aged coloring? Thank you. 1) You an use 4″ or 6″ in the design as long as you have the appropriate ventilation under per our installation instructions. Otherwise you have the risk of it cupping and/or twisting. 2) If I understand correctly, question 2 is based on question 1. Unfortunately since we don’t recommend attaching regular deck board directly to concrete, there’s no answer for this question. 3) The ipe silver patina occurs based on the direct exposure to UV rays. If part of the deck tiles will be covered by a porch and the other portion will be exposed to sunlight, they will patina at a a different rate. I am laying 24×24 deck tiles over my old concrete patio. I want to put the tiles down so they are level with the step out the door to the patio. This will require placing 2×6’s flat on the concrete to elevate the tiles and place the tiles on that. Should I place the 2×6’s every 24 inches on center or should I lay them 12″ on center for added support of the tile? Also, should I use a 2×8 instead of a 2×6? The tiles are strong enough that you can lay down your supports 23-7/8″ on center (the tiles aren’t exactly 24″). Your supports just need to be wide enough for the tile connectors, which are 5.5″ wide. So 2x6s should work fine. As with any building project, you should check your local building codes. Can I install these tiles over an old wood deck? How tall are they? Yes you can! The height depends on the tile size. 12×12 tiles are 1.63″, 20×20 tiles are 1.18″, and 24×24 tiles are 1.6875″. Is the height mentioned in your post of 3/20/18 including the connector thickness? Second question- do the cumaru tiles need to acclimate on site, like the cumaru boards, or can they be installed within a few days of delivery? Those heights do not include the connector. The connector is about 1/4″thick. All wood will perform best if allowed to acclimate, although deck tiles are designed to minimize the potential for movement.